Finely chop one small nori sheet. In a bowl, combine the chopped nori, salt, ½ teaspoon sugar and sesame seeds. Toss well. Wash and rinse the rice thoroughly in several water baths. Unlike basmati rice, no soaking time is needed. Drain as much water as possible. I placed the rice in a rice cooker with water and waited for about 20 minutes. You could also cook the rice on the stove. Just follow the instructions on the package or use the same procedure as for cooking jasmine rice. Once the rice is cooked, sprinkle with rice vinegar and light sesame oil (if used). Using chopsticks, gently stir the rice without breaking the grains of rice. Allow to cool to room temperature. Prepping the avocados: Slice the avocado in half and remove the pit. 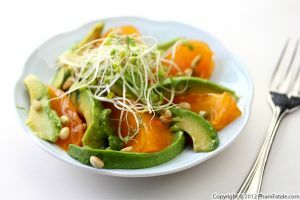 Using a sharp chef’s knife, cut the avocado into very thin slices. 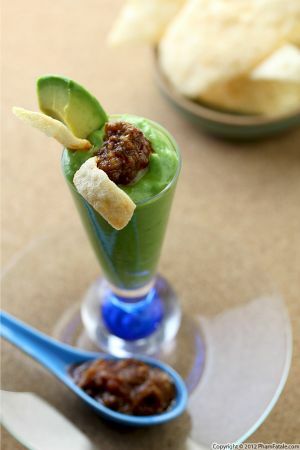 Drizzle with 1 teaspoon lime juice to avoid oxidation and cover with plastic wrap. Drain any liquid from the tofu. Pat dry with a paper towel. Slice the piece of tofu into thin slices. In a non-stick pan, heat some oil and fry the tofu slices and transfer to a plate, leaving as much oil as possible in the pan. Once the tofu is cool enough to handle, cut the pieces into ½" strips. Set aside. Prepping the carrots and jicama: Combine the vegetables with 1 tablespoon vinegar. Toss thoroughly. Drain and discard any liquid. Add sugar and set aside. For the kaffir lime sauce: In a small saucepan, dissolve the cornstarch in 6 tablespoons water. Add the corn syrup and kaffir lime leaf. Bring to a boil, then lower the heat to medium-low. Stir constantly for about a minute. Strain through a fine mesh sieve. Add the tahini, lime juice and yogurt. Line 2 sushi mats with plastic-wrap on both sides. Place one small nori sheet on one mat. Sprinkle with furikake seasoning. Wet your hands with warm water and take one handful of rice. Divide it in half. Put one half in the nori sheet and spread it evenly., stopping ½-inch before the end of the rectangle. Cover with the other sushi mat. Gently press so the rice adheres to the nori sheet. Flip the whole thing over so the rice is facing down over the mat. Remove the mat on top. 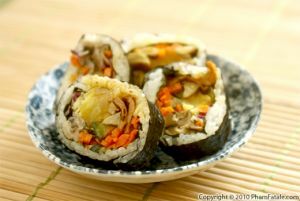 Place long strips of carrots, jicama, the cucumber matchsticks and fried tofu in the center of the nori sheet. Using the sushi mat as a guide, tightly and slowly roll the sushi mat away from you until the rice meets the other end of the rice to seal the sushi. Press gently with both hands for about 10 seconds. Remove the rolled sushi and transfer to a cutting board, seam side down. 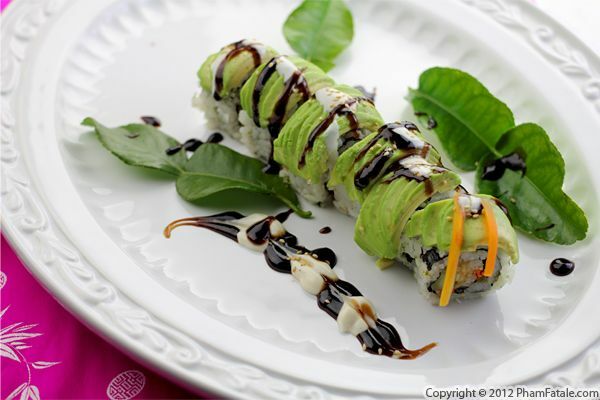 Cover the top of the sushi with the sliced avocado. Cover with plastic wrap and press gently with both hands to ensure the avocado adheres to the roll and is spread out evenly. Dip a very sharp kitchen knife in hot water, then wipe it clean. 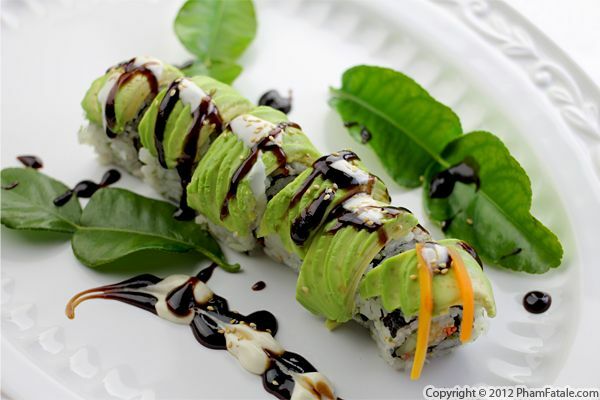 Cut the caterpillar roll in half, then cut each half in half one more time to make 4 pieces. Repeat the same procedure with the 9 remaining nori sheets, wiping the knife clean after slicing each roll. Line a large platter with the kaffir lime leaves. Place the sushi rolls on the leaves. Top the rolls with kaffir lime sauce and finish with a drizzle of hoisin sauce and a sprinkle of sesame seeds. Garnish with rolled pickled ginger on one side of the platter and wasabi paste on the other side. Serve at room temperature with hoisin and kaffir lime sauce on the side. Don't over-stuff the nori sheet or the sushi roll will burst; the diameter of the roll should measure about 2 inches. You can find all the ingredients listed above in Korean / Japanese markets. 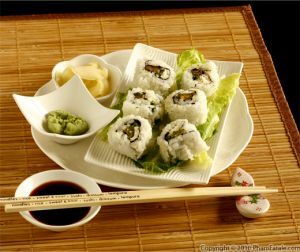 You can prepare the ingredients in advance, chill in the refrigerator and assemble the sushi the next day. You could add unagi (eel) to the filling and garnish with salmon roe. I wanted to keep the rolls vegetarian. Published By: Jacqueline Pham on January 8, 2013.